Cell Structure and Function moved to a fully Open Access publishing model in 2016. All articles in the archive are free, but the copyright conditions are dependent on the date published. Authors of all published manuscripts submitted after 1 October 2016 will retain copyright over their work. Copyright of published articles submitted before 1 October 2016 belongs to the Japan Society for Cell Biology. Open Access is a publishing model in which publications are made freely accessible online and may be used and reused in specific ways. Anyone with an interest and an internet connection can access, download, read, copy, print and distribute Open Access publications in line with a established set of licensing conditions (such as those of Creative Commons). Open Access increases the visibility and accessibility of research output without delay. What license does Cell Structure and Function use? Under the fully Open Access publishing model, Cell Structure and Function offers authors the Creative Commons Attribution (CC BY) 4.0 International license. Note that some funding bodies require publications to be published under a specific Creative Commons license. Before submitting your work to the journal, check with your and your co-authors’ funding bodies to ensure that you comply with all relevant mandates. How much is Open Access in Cell Structure and Function? There are many costs associated with publishing scholarly journals, such as those of managing peer review, copy editing, typesetting and online hosting. To cover these costs in the absence of journal subscriptions, authors (or their representatives) are asked to pay an article processing charge (APC). 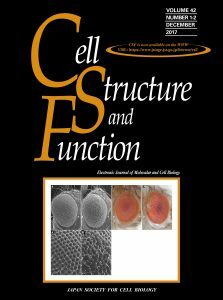 Cell Structure and Function charges an APC of ¥100,000 for all article types except commissioned Reviews and Mini-reviews, which are free to publish. When and how do I pay the APC? If your manuscript is accepted, the Editorial Office will send the corresponding author a copy of the Open Access payment form with instructions on how to pay the APC. Your manuscript will not be published until this payment has been received. No. The APC replaces the previous publication charges levied by the journal. Can I get funding to pay the APC? Some funding bodies allow grant recipients to use part of their grant money towards Open Access publication costs. Some universities and research institutions also offer financial support to pay APCs for their researchers. Please check with your funding body and/or employer to see if they have systems in place to pay for, or subsidize, APCs. Please note that the Cell Structure and Function Editorial Office will communicate only with the corresponding author regarding the payment of the APC. It is the corresponding author’s responsibility to communicate with any co-authors regarding payment of the APC. Will Open Access influence the peer review process? No. The journal’s peer review process remains rigorous and impartial. The Editor’s final decision is based only on the manuscript’s scientific merit and has no bearing on the authors’ ability to pay the APC. Who owns the copyright in my work? Authors of all published manuscripts submitted after 1 October 2016 will retain copyright over their work. Copyright of published articles submitted before 1 October 2016 belongs to the Japan Society for Cell Biology. What rights do I have with respect to my publications? As the copyright holder, you and your co-authors retain all the rights normally associated with copyright. What rights do others have with respect to my publications? What others can do with your publication depends on the Creative Commons license under which it is published. In the case of the CC BY 4.0 license, others may distribute, remix, tweak, and build upon your work, even commercially, as long as they credit you for the original creation. The CC BY 4.0 license is valid worldwide and remains in place as long as the applicable copyright. Does publishing Open Access mean my manuscript is compliant with my funding body requirements? Cell Structure and Function’s Open Access policies are compliant with the public access requirements of many major funding bodies worldwide. However, it is your responsibility to ensure that you and your publications comply with your own funding body’s or employer’s requirements.